distribution Primarily the Coastal Plain, though it does occur in the eastern and southeastern Piedmont and in the southern mountains. Likely present over other portions of the southern Piedmont between Montgomery and Henderson counties. In fact, range maps in Dunkle (2000) and Beaton (2007) show that the species ought to occur over the entire state, except perhaps for the northern mountains! Thankfully, the range map in Paulson (2011) matches that of the range map for NC on this website. abundance Generally uncommon in the Coastal Plain; much less numerous than the Common and Mantled baskettails within its Coastal Plain range. Very rare in the eastern Piedmont and southern mountains (and apparently absent elsewhere in these provinces). However, as the species is difficult to positively identify without hand examination, its true abundance is only speculation. flight Spring season for the most part, but sparingly into early summer. In the Coastal Plain, the flight is from late March to early July, but it is most numerous in April and May. Interestingly, Duncan Cuyler's records for the Great Dismal Swamp area are only in June, from Camden County; but his records elsewhere in NC fall between April and July (Roble and Cuyler 1998). The meager data for the Piedmont fall between early May and early July, whereas those in the mountains fall between mid-June and mid-July. A 2018 record from 27 February was nearly a month earlier than the previous earliest date. habitat Mainly at ponds or small lakes, rarely at slow-moving rivers. behavior Males patrol small territories around the pond margins. As with all baskettails, adults are more easily seen and studied when they are foraging or perching in an oblique manner on twigs a foot or two above ground along dirt roads and wide trails. comments This species was formerly called the Stripe-winged Baskettail, but only a few females show the characteristic "named" dark bar on the leading edge of the wings. The species averages slightly longer than Common Baskettail, but it is best separated by the thinner abdomen that is narrowed near the thorax, giving a more spindle-shape to the abdomen. 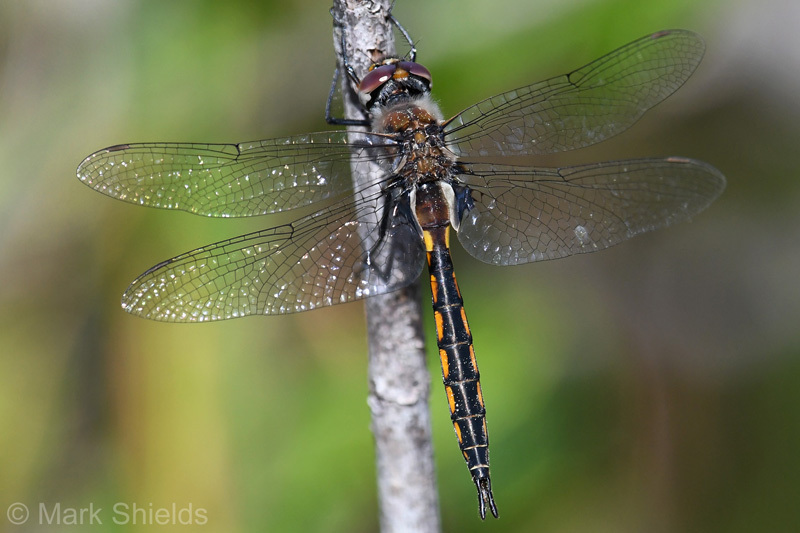 The species can easily be confused in the field with Common Baskettail, and thus observers are likely either overlooking this less common species or are reluctant to submit sight reports for it. In fact, the website editors determined (in late 2016) that one to several previous photos on this website are actually of Common Baskettails and not Slender Baskettails. Comment: Carteret, 2019-04-03, Croatan National Forest. Along Patsy Pond Green and Blue trails. - 4 males and 5 females, including one pair in wheel. Most were perched 18 inches or less above ground. - female. Comment: Carteret, 2019-04-03, Croatan National Forest. Along Patsy Pond Green and Blue trails. - 4 males and 5 females, including one pair in wheel. Most were perched 18 inches or less above ground. - male lateral view.